Today Neville was not happy. He has a cold, which added to his already existing strike against sleep is not improving his mood. He did a lot of screaming, and spent the majority of the rest of his time on the verge of screaming; being one dropped toy away from a full-on freakfest. However, he did manage to perform one amazing feat. While I was changing his diaper, he started playing with his toes, as he usually does. I went over to get him a new diaper and he managed to pee straight into his own eye. This of course made him screech as if he were on fire (and come on, wouldn’t you if you had managed to blind yourself, even momentarily with your own urine? ), but it was truly amazing… a perfect arc going from his little baby wang straight into his left eye. It was like something out of a cartoon. OK, I’m not sure what kind of cartoon would feature that sort of thing, but seriously– it was amazing. Lest you think I’m a horrible nanny, I don’t think it did any permanent (or even temporary) damage as he was fine two minutes later after he had screamed a bit (and he was on the verge of screaming anyway being in his mood). Baby pee is pretty much warm water at this stage– he’s peed on me a couple of times now and I couldn’t even smell anything. The pee dried on my shirt without a stain and left no other trace; it was just like water. it’s not even yellow. So there was my excitement for the day! It’s the Tasmanian Tiger, a marsupial whose last surviving member died in a zoo in 1936 (they were hunted to extinction)… OR DID IT? Like most of these shows, they didn’t find enough evidence to prove that any were still around other than eyewitness accounts, but they do have a footprint and a vague, blurry photograph. Anyway, the Tasmanian tiger is awesome because it has a gigantic jaw that opens way wider than anything else. Plus, it just looks cool. Poor extinct guys. Apparently some scientist is working on cloning one, Jurassic Park style. That would rule if they could bring some back from the dead! 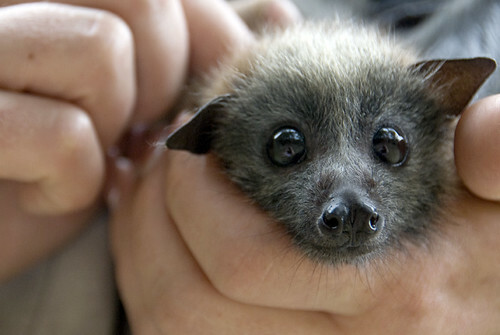 The other animal that I am currently enamored with is the fruit bat. They are so cute! awww, isn’t he adorable? They can have wingspans of 6 feet, too! awww, this one is so cute I can’t stand it! So I’ve been looking up info on fruit bats–they’re just awesome. Bats are so interesting with their echolocation (except fruit bats rely on big eyes and sense of smell only) and wings for arms and stuff. Rock on, bats!